The Council-owned land included one of the six remaining municipal incinerators designed by Walter Burley Griffin and his business partner, Eric Nicholls (1932). The Council-owned land included one of the six remaining municipal incinerators designed by Walter Burley Griffin and his business partner, Eric Nicholls (1932). Griffin’s lifelong partner, Marion Mahoney, was by this time in India. She had done much of the design and most of the drawings for the competition they won for the design of the National Capital, now Canberra. Incinerators such as these no longer operate because of their toxic fumes, but at the time they were regarded as a great improvement over dumping garbage at sea, which was the previous practice of Glebe Council. There are signs all around the incinerator explaining its operation, and they are well worth reading, as they won an Architecture award for their interpretation of an industrial site. 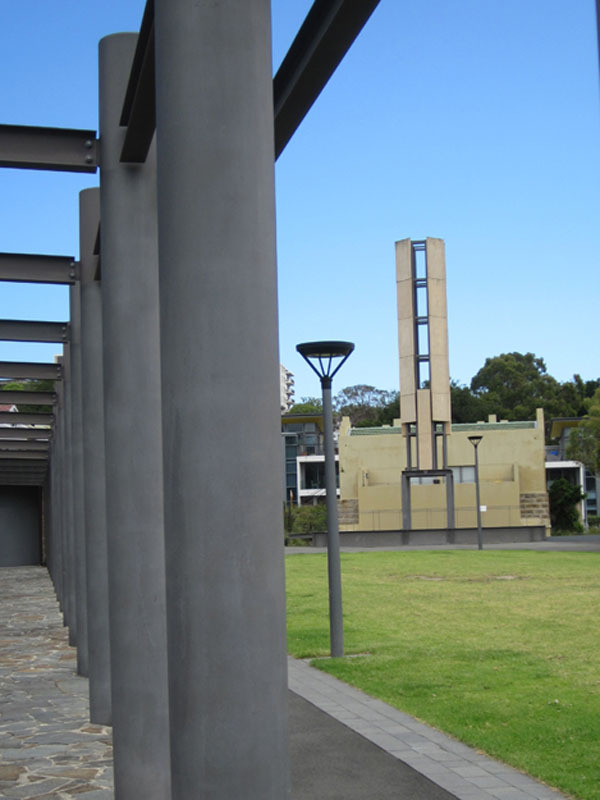 The rows of columns extending from the incinerator to the walkway are an interpretation of Council sheds designed by Griffin as part of his landscaping of the site. Griffin was a student of Frank Lloyd Wright, the most famous American architect, and his Australian designs reflect his interest in Mayan temples and the modernist Art Deco movement.